Our cider is fresh pressed every Friday right on the farm. It’s a sight to behold. Made with NO preservatives or pasteurization. People come for miles to get our fresh cider. Make sure you come early as we tend to run out quickly! We will press on three Friday afternoons this year: Oct. 12, 19 and 26. *Please remember, unpasteurized cider can be a health hazard to infants and to the elderly. Come enjoy live music, great food, woolens, fiber arts and crafts, children’s activities and more! See Baloo Baleerie, Barber’s Bunnies, Hope Library, Hope Spinnery, Maine’s Natural Inspiration, Northern Solstice Alpacas, Partners for Enrichment Food Wagon, Sam’s Face Painting and Wandering Goat. Rosey Geary and the Route 17 Ramblers will play from noon until 2:00pm. Friday: Start the variety weekend Friday evening by sampling over 20 varieties of Maine grown apples and pears with pie by the slice from 6:00pm – 7:00pm followed by a Story Slam at 7:00pm. The Story Slam is a shared event with Sweet Tree Arts and Hope Orchards. Each storyteller tells their story around the theme of ‘How I got here’. These are personal stories that are told and not read. Stories may contain adult content. Story Slam tickets are $15.00 (shipping additional). 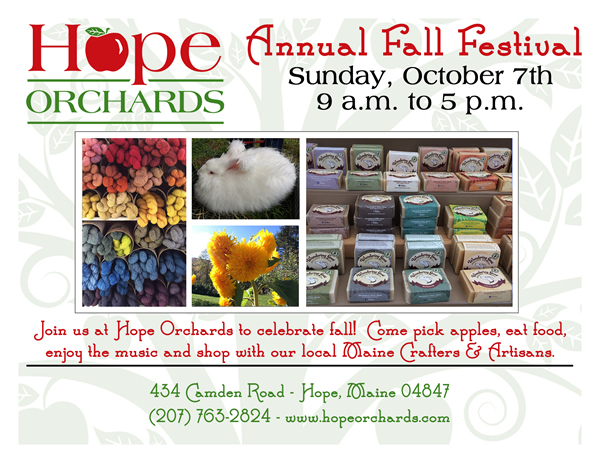 Tickets will be available at Sweet Tree Arts, at the Orchard during the season. Saturday: All varieties available for tasting, pairing and purchase all day until 5:00pm. Maine Street Meats will join us from 11am – 4pm for variety pairings. Pie by the slice available. Sunday: All varieties available for tasting, pairing and purchase all day until 5:00pm. Appleton Creamery will join us from 11:00am until 4:00pm for delicious cheese pairings. Oshima Brothers live concert from 2:00pm to 4:00pm. Tickets available at The door. Pie by the slice available. Our pie by the slice is baked and provided by Washington General Store. We offer State of Maine Cheese’s Katahdin Cheddar to compliment your pie slice, or for purchase. Our last and largest cider press. Cider freezes very well and we take orders in October for large quantities from this batch. Get on the list so you can enjoy hot cider all winter!